At the recent PV Asset Management and O&M event in Hamburg, Germany optimizing solar operations and maintenance strategy to maximize asset yields was a top focus. In this episode, we talk with two senior solar professionals who spoke at the event and participated on its “Aiming for Operational Excellence” panel. With them we can recreate, if you will, the panel discussion. They also represent two key aspects of the industry sector, the developer and the O&M provider. First on the developer side is Stefan Müller, Co-Founder and Board Member at Enerparc AG. Based on industry research, Enerparc is a Top 10 global EPC company and number 1 in Germany. The company has connected 1.700 MW to the grid, operates 1.000 MW of its own PV power plants and globally has over 1.300 MW under O&M contract. This episode also features Vassilis Papaeconomou, Managing Director of Alectris and the SolarPower Europe O&M Task Force Leader. Welcome to the “Solar O&M Insider,” the first podcast series dedicated to solar PV operations, maintenance, and asset management. This series is brought to you by Alectris, a global solar asset care innovation firm. I’m Glenna Wiseman of Identity3, your host. At the recent “PV Asset Management and O&M” event in Hamburg, Germany, optimizing solar O&M strategy to maximize asset yields was a top focus. Joining us here at the “Solar O&M Insider” are two guests who spoke at the event and participated on the panel, “Aiming for Operational Excellence.” With them, we can recreate, if you will, the panel discussion. They also represent two key aspects of the industry, the developer and the O&M provider. First on the developer side is Stefan Müller. He is the Co-Founder and Board Member at Enerparc AG. Based on industry research, Enerparc is a top-10 global EPC company and is number one in Germany. The company has connected 1700 megawatts to the grid, operates 1000 megawatts of its own PV power plants and has globally over 1300 megawatts under O&M contract. 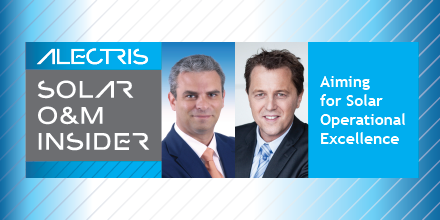 Also joining us is Vassilis Papaeconomou, Managing Director of Alectris and the SolarPower Europe O&M Taskforce leader. Vassilis: Thank you, Glenna. It’s been nice to hear your voice again and happy to be here with Stefan today. Stefan: Thanks a lot for the invitation. I’m happy to make a lively and open conversation now on this podcast. Glenna: Perfect. Stefan, let’s start with you. Our conversation today has to do with “solar asset operational excellence.” You obviously have a lot of experience in this area, and you and Vassilis were on this panel at the recent event. What does this term mean to you? Stefan: I think the words “solar asset operational excellence” explains also at the end what it is. I think we permanently have to work on to improve our general services, and services means for our internal customers and for the external customers, that we should not lose the focus also to look into other industries. I mean, the PV industry is already matured, but there are other industries, especially when you look into asset management, probably the wind industry or even the hydro industry, is much more matured. So, we should open our eyes, what the other industries are doing to improve the solar operational excellence. Glenna: Excellent. And, Vassilis, how about you? You’ve come from designing and constructing assets to now operating them globally. What does that term mean for you? Vassilis: Well, when I hear this term and this has been heard very, very often. I’ve been hearing these “optimization and excellence” terms for years now. But I think, you know, when people talk about that, mostly talk about technical matters, so how to improve an inverter or, you know, stuff like that. I think the term has actually a very broader meaning and does apply both to technical and the operations. So, what we want to achieve by excellence, and when we talk about optimizing performance, is the overall optimization. Not just a tiny bit of it, like how an inverter works better, but how we operate plants better, how we manage power plants better, so we improve the actual financial result. And, this is, I think, a point that shows the maturation of the industry because, initially, it was very technically focused, but it’s now shifting into a much broader perspective, which includes the operations, the asset management, and everything that actually belongs to operating assets. Glenna: So, Stefan, you just mentioned that the industry could look to other more mature industries. Do you think that energy, more mature energy industries, are where we should be looking, or do you have some other insights into your thoughts there? Stefan: No, I think it’s probably really a focus on energy, and I would not look into wind industry only. I mean, you can look into facility management or something like this. There’s probably also a lot of tools, how you can manage and how you can improve all the solar assets. So, this is not only on Excel sheets or other tools, it’s probably also processes. And, this is what we are doing. We are talking a lot with other industries to get a different view. Glenna: And, Vassilis, I know that you have some wind and other areas that are potentially coming into your portfolio, and I have personally been in O&M meetings where, wind and other kinds of more traditional industries are entering into solar. Is there anything that you see there around that? What can we take from other industries that would help operational excellence in solar? Vassilis: Well, to be honest, I’m not very knowledgeable about all these other energy sources. I know a bit about wind. And, being in the Taskforce in SolarPower Europe, we have in discussion to what extent we can actually get some help on someone that has done stuff already. And, I have to admit that, very honestly, in this market, especially in conferences, I have a very weird feeling that the PV industry is actually reinventing the wheel to some extent. So, we are discussing, to an extent, some basic things that do not apply to PV alone, or wind, or anything. It’s generally applicable stuff, and we’re discussing around basic concepts. As Stefan said, processes, for example, is a key element to talk about optimization. So, I think that shows, in general, that the PV industry is maturing. It’s still lagging behind, and there’s a good reason for that because it’s still new, first of all, but there’s a lot of ground to cover there. Being in all these conferences in the past few years, you can see the differences of understanding and knowledge in the market already. Glenna: …for one panel, but, you know, let’s see what we can do. Stefan: Yeah. No, no. I think it’s the right question because at the end…at moment, we are working also with, call it “standardized monitoring systems,” which are run by, I would say, operation and maintenance engineers or technicians from remote. But, we recognize also that the outcome of this monitoring system has a different type of personality behind it. It can be the bank who wants to have the report, it can be the investor who wants to see if I’m in line with my cash flow, but it can also be, a technician in the field who wants to know how often I’ve seen already a failure on this kind of inverter. But, let us be also realistic, at the moment, everyone is probably looking for the magic tool, for the Holy Grail which, I think, will not be there. I think, interesting is probably to integrate additional intelligence system with the right interfaces, and this can be the pure cash flow asset management tool linked to the monitoring system, who is linked then to a data management system, and linked to a documentation management system. So, I think the key is now, how we can create the best interface between the different expectations. Vassilis: Let me add, Glenna. Because, just by coincidence, I’m actually preparing a presentation on IT systems, I think the markets…the solar market has been focusing for too long, or for many years on data acquisition alone, what we call the monitoring system, but this is data. I mean, the data alone cannot optimize a plant. And, just to enhance what Stefan just said, we need management systems, we need integrated management systems, how to convert data into information, and then convert information into knowledge, and, you know, ultimately into wisdom. Glenna: I think also the holistic picture. We just saw GTM, Greentech Media split out their O&M and asset management report. This whole area of software is really maturing in the industry, and yet there’s still this whole in his particular…that particular analysis relates to, you know, we need integrated solutions. Is that what you’re referring to, Stefan? Is an integrated solution, not siloed applications that don’t talk to each other? Stefan: Correct. I think this is probably also the challenge for us, yeah, who are coming from, I would say, Excel-based analysis systems. I mean, there are new players coming into the market, but they need also more data, and this means automatically that we have to work on collecting more data and try to find a way to get the best analysis out of it. Glenna: And, that’s what you’re talking about, Vassilis, right? Vassilis: If I may add to that? I mean, in my mind, although probably not linguistically correct, I differentiate between data and information in a way that… The way I understand data is what is captured by data acquisition device. So, it’s a hardware thing that just measures and delivers some numbers. I think this should be, at least, combined with information. So, if we want to have a more holistic view, we should combine what the outcome is in the plant, what we see from the data acquisition system, and we need to combine that with other relating information, all the relating activities, the field activities which can extend into the financial part as well. And having these two types of information or data together, then you can create knowledge out of that. Glenna: Well, let’s stay on this software theme because I think we’ve hit on a part of it, and I’m assuming that this was a lively part of your discussion at the panel. Is that correct? Vassilis: It was, to a certain extent. You know, the time is very short in the conferences, and you don’t have really the opportunity to answer all questions. But, for sure, this software topic is a very hot topic in the market, and that’s from the source of solar asset management software research coming from Greentech Media which, I believe, is the first one of its kind. Glenna: Let’s talk about the human side of the reporting for a minute because one of your points that you talked about was the right technical team to understand the data. So, we’ve talked about the software side of it, that the industry is evolving into more integrated software platforms that allow the owner/operator to see a more holistic view of what’s going on, basically have all the information that you need at your fingertips. What about the team? Stefan, how do you make sure that the team that you have is able to look at that data and interpret it so that you’re actually really optimizing to use that overused term in the industry, “your assets”? Stefan: I think, for Enerparc, we have already two different views because on one hand, we manage and we operate our own systems, and then we do it for sure also for external. And, it’s quite interesting. If you are managing your plants by yourself, and you are in the whole value chain, so, I mean, from the operator to the guy who is cleaning the modules or cutting the grass, then generally, you can still focus really on the main topic, which I believe is the technical availability of the solar plant. Not unfortunately, but fortunately, we are working a lot with external clients and also with banks who are not so matured in the technical understanding. And, very often, we speak with banks who want to have a report, who don’t know what is performance ratio, yeah? And then, automatically, you prepare documents, or papers, or reports, or you answer questions which are not concentrating on the main focus, and the main focus for us is really technical availability. And, if you have a chance that you have one team in a whole value chain who is then really talking to each other and saying, “Hey, we have an issue with this piece of cable,” or “This cable tie is loose after a few years or is not UV-resistant,” this is where I think you can really get out of it, something. And, you can really improve the yield of a power plant if you talk to each other and if you focus on the core components, and this is from my point of view, the technical availability of a solar plant. Vassilis: I think Stefan touched a very sensitive topic here. Apart from software and teams, what we see is, in the market, we’re lacking some very basic stuff, as I said in the beginning, and one of it is some sort of standard language. I mean, there are terms right now that are not universally understood, or not well understood, and this is actually the part where standardization comes in. It was not part of the discussion at this time, but it was in my presentation later on, and basically what we’re doing in SolarPower Europe. So, to begin with, in order to start communicating, we have to start speaking the same language, and this is absolutely essential. For a long time, we considered that being, you know, kind of natural, but, as Stefan confirms, it is not. I mean, there are stakeholders that have either no or very different understanding of what the basic KPI of a PV plant is at the end of the day. Also, to name another simpler example, when we talk about asset management, if you ask two people in the market, “What is asset management for solar,” you get three answers. So, I think very basic stuff is, we need to standardize our approach as an industry, agree between us, you know, what the terms are meaning, what we mean under these terms, how things should be done. And, that would be a very basic foundation, I would say, of progress because without that, we will all be speaking different languages, and I don’t believe it’s going to help in the further maturization of the industry at the end of the day. Stefan: Yeah, and I can only add to one topic. I think, when we speak about a team, then the team is not only on the operational side, the team is, as we mentioned, also the clients. We had an interesting conversation on the panel discussion when there was a question from the audience, “What is your wish? ” And, the answer was, “A trustful relationship.” It’s a simple word, but at the end, it is important. Because we would like to look above the shoulder and try to help also to improve the power plant, and not looking permanently into our contract, and having serious discussion. If one simple string inverter out of thousands has a failure, and we should exchange it immediately. So, it is much better to think of it about how we can improve the whole financial situation of such an investment, and it can be also improvements of the power plants, yeah? And, we are very much open to find also, and to work with these types of teams where I would include the customer. Vassilis: I think this is a major point that Stefan is raising. Trust between stakeholders is absolutely essential. There’s numerous reasons why there is less than optimum trust or maximum trust. My main understanding there is that the market is rather new, and there’s no track record of most of the stakeholders, but it is a major element, where we believe some sort of standardization and basic agreements between the stakeholders is going to be very helpful. And, at the end of the day, I think this is going to assist in really optimizing the assets. And, if I can tell my personal experience there, as a third-party contractor, we have customers that are not so knowledgeable and customers that are extremely knowledgeable. In the second case where people understand immediately, and they understand the competence, they move forward much more quickly. In the first case though, due to limited trust, until this is built up, of course, after a couple of years, or more even, people are very hesitant to take steps forward in any sort of way that you’re suggesting as a contractor, and that’s actually not to their own benefit. Actually, when I’m talking about, I have two customers in mind, similar plants, similar locations, very identical situation. The first one was a very slow mover because there was limited understanding there. The second one was the exact opposite. And we see after some years, the results on the operation of their plants. It’s an order of magnitude different because we were simply allowed to do stuff that were, you know, correct. In one case, we moved very fast, in the other case, we have to move very slowly because of this mistrust or limited trust element that was there. Glenna: Well, and I think, too, that the standardizing or the… Everybody is speaking, as you said, Vassilis, the same language. If people understand the contracts, and they understand the reports, and everybody is kind of on the same page with that, then that does help to build transparency and trust, correct? Vassilis: Absolutely. I think that’s the absolute essential between cooperating parties, whether this is an asset owner and a contractor, or a bank and an asset owner. I mean, there must be at least a minimum level of trust and understanding between the parties. Glenna: And, when we’re talking about standardization, we’re not necessarily saying that every plant needs to have the same action items, or KPIs, or, you know… They’re all different, they exist in different environments. They use, to some degree, different equipment, so we’re not saying that. We’re talking about standardizing the language and a set of protocols to embrace or to approach each project, each plant. Is that correct? Is that how you both look at that? Stefan: I think we would love to do it, but let’s be also realistic. We have different countries and different locations. And, for example, in UK, you have perfect sites where you have no evacuation issues, and then you have also in remote areas, also active curtailment. So, that means you have to work very actively with the DNO, with the District Network Operator, or the utility itself to find a way that they are doing this curtailment a bit in your favor. But, this means really sitting together, talking openly to each other, and finding a solution together with the utility, with the DNO, with the asset owner, and with the O&M operator. Vassilis: About standardization, there is, I think, generally sort of a misunderstanding or people are afraid of that. I tried to make this clear, you know, during my presentation in the conference. Because when we talk about standardization, people think that someone is going to prescribe what exactly I do in my plant, how often do this, and that maintenance, but that’s not standardization. Standardization is more a process of showing how things should be done and define a minimum set of activities. To give a simple example there, think of the ISO 9000 certificate or standard. This applies basically to virtually any business. And, you know, by saying “any business,” there’s numerous types of businesses with very different scope and activities. Nonetheless, there is a standard there that describes what is minimally that you need to do, and how you do it. So, I firmly believe that standardization is something that can be achieved, it has only to be integrated differently. A standard is not something that tells anyone what exactly you need to do in terms of maintenance and other activities. It just shows the way, what is the minimum, let’s say, set of activities, and how these should be done correctly. Glenna: Let’s talk about predictive maintenance for a minute because I think we could spend a whole hour on this reporting and standardization question, probably on either one, actually. So, Stefan, how does your team generally approach predictive maintenance in your portfolios? Stefan: I think the predictive maintenance, I would say, is a quite basic work. Predictive maintenance means inspection, very simple. There are a lot of newer tools or systems in the market like drones, but, at the moment, I don’t see that the drone, for example, can replace a technician who runs through the module rows and try to see with his own eyes if everything is under control or not. I think there are a lot of additional tools which are interesting. For example, to see, also, and to find out patterns, if you probably permanently have an issue with this batch of cable ties or something like this. And this is, I think, for us, preventive maintenance. So, I think the people in the field, educated people in the field are still, for me, very essential to find out what can go wrong in the future. Glenna: Vassilis, do you have comments on that? Vassilis: Yeah, I mean, predictive maintenance is another very discussed topic. It’s vaguely defined, but the way that I have understood that in various conversations is, what people understand are predictive maintenance is from data you receive from a solar plant to predict a trend, so to predict that something is going to fail before it fails. That’s very nice to do because basically you have an intervention, a much lower cost because it’s not an emergency intervention, and you have no downtime. So, it’s like looking into the future. I believe that I’ve heard throughout these years, there are several tools that do that. Maybe to what extent this is, at this stage of the technology in solar business, successful. Not because the IT capabilities are not there, just because solar plants are very different from each other. Equipment are different, devices are different, inverters are different, climatic conditions are different, so we’re in more a chaotic situation. And, obviously predictive maintenance is something of great value, if it can be universally applicable, not on a specific type of plant, specific region. But, in general, I would say that that would be really a dream to have such kind of tools there. I mean, to predict the future, do something before something bad happens. Stefan: Right. I think one interesting idea is also this drone, but we are in discussion now with a few manufacturers, but there are some legal topics. But why not to develop much smaller drone, which is really intelligent, sitting on the O&M container, and flying over the field by themselves? And probably marking modules where there is a temperature difference, and then to check after a few days again, if this is more of the leaf, or if this were some birds on it, or if this is a real issue, if there’s a hot spot. And to send a short message to the operator and say, “Hey, I think something can go wrong in the future.” This is for me, also, you know the next steps, the level…whatever, 2.0 in these O&M activities, and we are looking forward to see this. We see a few companies are coming up with this, and again, it’s coming from other industries. Glenna: So, you both were on the panel there in Hamburg. What other kinds of topics do you think are relevant, if we’re going to cover this, we’re going to recreate this panel discussion? And, were there interesting questions from the audience? Stefan: As I mentioned before, and I think, for me, it’s always interesting. I think, during this conference, we had also the anonymous questionnaire system via a simple app. And, what I always recognize is that we, who are quite deep in the market, we always have to learn and to recognize how basic the questions are during such a conference. For sure, there are always some new entrances coming into the industry, but it looks like that, from time to time, we should also make a step back and try to listen to these basic questions, and giving them also a bit of an outlook, how easy or how difficult asset management is. Vassilis: I agree with Stefan on that. I think probably one of the reasons of having, in certain occasions, some basic questions is because the market is expanding very fast., Not only geographically, but new investors are coming in, new stakeholders, so it’s not a close family anymore, a handful of stakeholders that, you know, talk with other every day. We see this, that there are also technologies being, you know, used practically in every corner of the world. And, it’s more than normal that actually, in some areas, in some new region, some solar-emerging markets, that there will be more people coming from these emerging markets, there’s going to be more basic questions than others. But, in general, I completely agree with Stefan. You know, Europe is the most mature market, currently the oldest one, and especially Germany, we do see some surprisingly basic questions, which is not a bad thing. It just shows the need of conferences of that kind. Glenna: Excellent. Well, thank you, both, for recreating this panel discussion here on the Solar O&M Insider. Vassilis: Thank you, Glenna, always a pleasure. Stefan: It was also a great. Thanks a lot for recap everything, and I think for us it was very interesting. Glenna: Excellent. And, thank you, listeners, for joining us for this session on creating solar operational excellence. You can access more information about the “PV Asset Management and O&M” events at the producer’s website, newenergyupdate.com. Email us at marketing (at) alectris.com to send us your ideas for topics and guests for the series. I’m Glenna Wiseman. The Solar O&M Insider Podcast Series is brought to you by Alectris at alectris.com.